Is Canberra a ‘bogan place’? That’s the name on a street sign in Kaleen. Photo: Glynis Quinlan. Canberrans have the highest average incomes in Australia, tend to be the most educated people in the nation and have an impressive range of cultural institutions, hip cafes and trendy restaurants to visit. Sounds sophisticated, one would think, but is there also a ‘bogan’ side to our carefully-planned city? 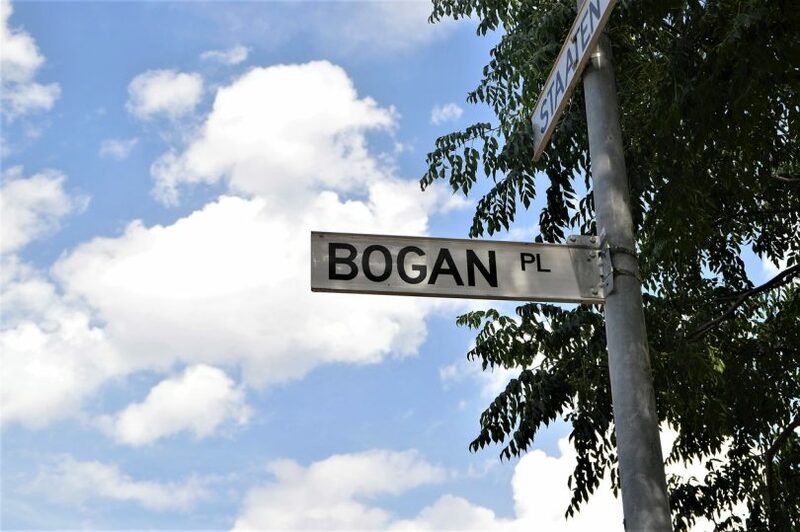 After all, we are also the home to a street named ‘Bogan Place’ (a bit of a giveaway) and one of our biggest annual events is Summernats – which this year reclaimed the title for the world’s largest simultaneous burnout (the ultimate bogan record). So what is a ‘bogan’ anyway? ‘Bogan’ is an Australian and New Zealand slang word defined by the Oxford English Dictionary as referring to “an uncouth or unsophisticated person regarded as being of low social status”. The term conjures up ideas of everything from mullet haircuts and ugg boots to hoon drivers and binge drinking. However, in recent times it seems to have moved further away from how much is in your back pocket and more toward matters of taste – leaving Canberrans more at risk than ever. For example, chances are there are several children in our city whose names have made it onto writer Sabrina Rogers-Anderson’s pick of the top bogan baby names for last year. Check out the list by clicking here. According to Sabrina Rogers-Anderson, the top four bogan baby names for 2018 were Bylan, Chavelle, Carridyn and Espirit. A social media site named ‘Subtle Bogan Traits’ is rapidly growing in popularity as contributors offer their insights into some tell-tale bogan traits in this new world order. Below you will find a number of ‘subtle bogan traits’ which Region Media has selected from the Facebook site to aid you in your process of self-discovery. Check out whether you or your friends share these traits and draw your own conclusions or go to the site to check out the full range. Holding your ticket up at the deli counter like you’ve won a prize when they call your number. How did you go? Do you have any ‘subtle bogan traits’? And do you think Canberra is a bit bogan? Let us know in the comments below. Not sure that someone named after a teenage witch should be judging names. Yep, I’m a Bogan……but none of them ridiculous baby names, mullets and Summernats. Hand me a green can will ya ..
Amy Warland... this is the street I was talking about! To qualify as a real bogan you have to be born out there! In Parkes I grew up near Bogan Street, used to ride my bike out towards Bogan Gate, then married a girl from out on the Bogan Road who lived near the Bogan River! well, if it’s open slather on Tuggeranong, let’s try this one . . .
Q. What is the first question at a Charnwood quiz night? A. What are you lookin’ at. Everyone is someone else's bogan. Adeel Saleem the list is in the article too! Bogan place is in a suburb named after rivers. Canberrans are the worst kind of bogan... the cashed up version. Tuggeranong or should I say Thugeranong. It seems there are some who have little to do in their life so they graffitti or spend their time doing laps speeding or burnouts, especially if it is raining! Wow - hard to believe anyone isn’t a bogan! “Carrying around black garbage bags full of old clothes in the boot of your car for 8 months before going to the Salvos”: I’m currently doing this (way past 8 months now). Haha you ARE one of those! John Kirubaithilakan I can take them off your hands! My mum volunteers at a charity op shop. John Kirubaithilakan you are many things but not one of them is bogan. Not even subtle bogan.